Damien – so what do we go tell Mark to do? Esti – Adam and Kyra. Unless we want to separate someone else but I don’t want to bring that up. Dane – I don’t want to bring that up either. But getting a big target out before triple eviction would be smart. Esti – this is what I am going to tell him. If you want to get a big target out do it but make sure you don’t piss anyone off before the triple. And the way to not piss anyone off is to put up the only target that is alone right now. Which is Adam. He’s a huge target. No one is going to get mad. You’re going to have the votes to get him out next to Kyra because realistically she is the perfect pawn. So that’s all laid out. Adam was right behind Mark in this comp. He is good at mental and physical. So that is the biggest target in this house right now. The biggest competition. And get him out right now because right now he’ll have the votes. Who knows what relationship is going to build if he stays here for another week or two. Dane – he’ll win the POV. Esti – yeah and if he does we will think about another thing. Right now we all have a very good chance at playing in the POV and you’ll give him a run for his money. Dane – I know. Esti – I feel like he (Mark) is going to take Adam or Dane into Wendy’s. I don’t think he will take me.. and I really want some Wendy’s. 10:07pm HOH room. Mark and Dane. Dane – everyone keeps asking me what you’re going to do. Mark – yeah its good and bad. Like no one really knows what Mark is going to do. Like obviously the idea is Esti or Damien. One of the two will have to go up. I am trying to decide whats the better play. Honestly I think keeping Esti is better in general. Dane – She came up to me and asked Dane why didn’t you do better? A) I didn’t need to win this one. And B) if I did win this one you guys would probably try and put.. Mark – I don’t think I’ll put both of them up initially but one of the two will have to go up. I have to think about who the other person is. It’s obviously not you. Dane – I don’t think you should put up one of the boys. Do you think you should? Mark – yeah, I’m thinking about it. He’s (Adam) not going to be happy. Dane – tell him… tell him why. Mark – oh I would and I think he would understand why. Dane – everyone is thinking him. Mark – And Anthony says it goes inline with our story. And we could easily keep him. The way I look at it. Lets say I put up Adam and Damien. And if Adam takes himself off, then we put up Esti. And then we decide who goes, I would prefer Damien. Dane – Damien. Mark – he is just stronger. Dane – we need to keep the weak people here. Mark – exactly. And if Damien wins, then we still put up Esti. And we’ll have the three votes. Just please, please don’t tell Adam. Dane – I’m not going to tell him. You can tell him. Mark – and I will tell him. He will be upset but I was on the block because of his own girlfriend. And by extension its him. This isn’t about me being bitter. This is about showing some character now. You touched the block and you were a man. You went to Cory and said listen buddy, put me up and I will take myself off. And not only that Adam, even if you don’t take yourself off we will still vote to keep you. Mark – I was thinking of taking Damien to Wendy’s. Dane – he (Adam) is going to come in snapping. 10:40pm – 11:05pm HOH room. Dane, Mark and Adam. Mark – if I took you (to Wendy’s) that would look so silly. Adam – why would that look silly? Mark – because the whole house thinks that you and I have a bone to pick, right!? Adam – why? Oh the whole Sam thing. Mark – Sam was very much you. You guys thought together, ate together, drank together. Adam about noms – I feel like me and Dane have an idea in our heads and you and Anthony. Mark – who are you thinking? Esti and Damien? Adam – did you know, know Chelsea? Mark – they told you, huh?! Mark – they told you, HUH? I don’t really know her. Wouldn’t it be awesome if Adam and Anthony hit the block? I dipped 4 weeks ago and thought I’d check in to see if there are any survivors? Boohoo. Still screaming at the Sky while continuing to watch BBCan. GAL……..
Dane is losing his mind this morning because he doesn’t understand Mark’s likely nominations. He’s talking to himself and seems to be contemplating whether Mark is trying to do something hinky and odds are he is probably CORRECT lol. Given Mark won HOH that means he won’t be able to win triple eviction so theoretically this would be the week Mark makes his move. Mark implied Adam would go up to each of Este, Dane, and Damian and told Adam that Este/Damian are likely noms plus pretty much told Kyra she’s safe. I didn’t see any Cory/Anthony chats. Most intriguing was Este PROMISING she’sd vote out Kyra/Adam before him in triple eviction which may have saved her going up since we know Mark wants to drag two goats (Kyra/Este or possibly Damian) to the end. What I’m trying to figure out are Mark’s true intentions. If Adam won POV then Mark could play it off & say he just did that to throw off the house about the PBs. But we know he wants to take out the beasts (Adam/Dane). I’ve contemplated whether Mark would put up both Adam/Dane but that seems unlikely b/c it increases the chances of one winning POV (and doesn’t make sense to anger both and then fail to get out either). Mark knows other than Kyra everyone else prefers to keep Dane. 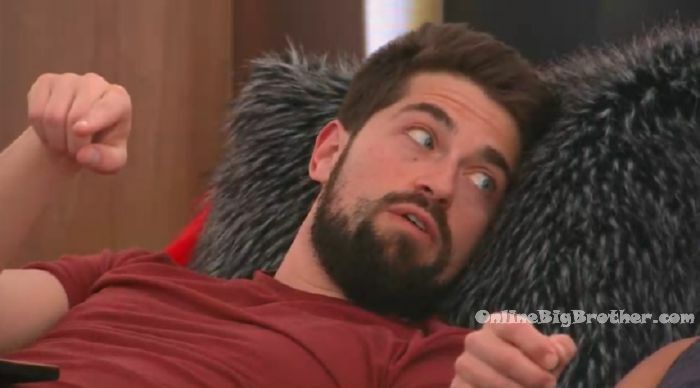 And even that isn’t in stone since Dane told Mark this morning that a crying Sam sat down Kyra/Adam & him to get Kyra to totally trust Dane moving forward & apparently said she was leaving b/c she didn’t stick to Dane/Adam (insert eye roll). Anyway, so much has to fall right for Mark to take out Adam (or Dane) including none of the PBs winning POV. Plus ideally, Mark needs Damian, Kyra and Este OFF the block to vote Adam out which means either putting up Anthony, Dane or Cory for that to happen. The only alternative would be if Mark has some sort of “intel” or diabolical plan in mind to take out Adam. We did see he was able to tell Adam of the backdoor Sam plan & get away with lying he said it so maybe he has something else in store for us. All of this coupled with hints the “box room” will come into play this week, the camera centering on the tape recorder last week and odds are this could be another failed shot at the PBs especially if the wrong person wins an advantage from that room. When Dane was up so early this morning ranting to himself in that room it made me wonder if he would luck into getting it. My thing is – who would actually use a power to shake up the house? Mark for sure would. Kyra regardless of what they say would probably take a shot at Dane (but also Cory and could easily be enticed into taking out the two ladies), Este would target Kyra (& Adam), Damian despite his “all guy” banter seems close to Este & I’m thinking would go after in order Adam/Mark/Anthony but that’s a guess & Cory would target Este & perhaps Damian. So the only people I’d want to see win the power are Mark or Damian b/c I don’t trust Kyra wouldn’t use it take out Este/Cory despite her Dane hatred. Anyway, at least we (MIGHT) get to see something different this week & unexpected. Or the powers that be may ruin it by putting power into the PBs hands. We’ll see.